Emanuel and Katrina Ramirez, with Emma. Their other daughter, Lily, is spending some time with her grandparents in Oklahoma. From the sidewalk on West 11th Street, the only thing that seems odd about this shaded, two-story house is the yellow emergency tape. But a closer look reveals broken windows, the screen door ajar, scorch marks on the porch and a melted DVD case lying just to the side of the walkway. A few steps closer and the stench of the fire that destroyed the Ramirez family home is overpowering. 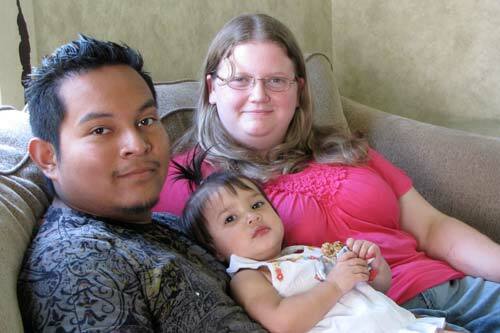 Katrina and Emanuel Ramirez had been thinking about moving to Wichita or some other bigger city. They were married five years ago in Concordia, but some place bigger would be more job opportunities, they reasoned, and more activities for the growing family. Then their home was destroyed by fire in the predawn hours of June 4, and they experienced first hand the generosity and kindness of people in Concordia. So now they’ve decided this is where they will stay. What happened started on the evening of June 3. As Katrina tells it, their daughters — 3 year-old Lily and 8-month-old Emma — were both fussy that night, “really fussy.” So instead of sleeping in their own bedroom downstairs, the girls were in their parents’ upstairs bedroom. Emanuel’s brother Javier was in his own bedroom down the hall. As the hours passed, Emanuel and Emma were asleep but Katrina was still trying to soothe the fussing Lily. Then, about 2:30 in the morning, she smelled smoke. She woke Emanuel, who looked into the hallway outside the bedroom door to find “a tornado of dark smoke.” Katrina grabbed Emma and Emanuel grabbed Lily, and as the family headed toward the stairs, Emanuel stopped only long enough to pound on his brother’s bedroom door. All five made it downstairs and out safely, but the fire was spreading throughout the home. The one occupant who did not make it out was Ariel, a 7-month-old Golden retriever. 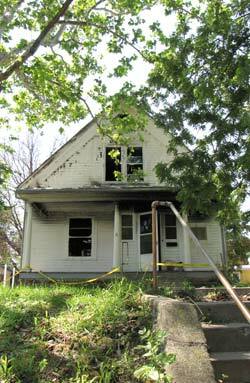 Firefighters would eventually find her body in the living room by the front window. The North Central Kansas Chapter of the American Red Cross arranged for them to stay at the Concordia Super 8 motel for four nights, until they could find a rental house. They were still at the motel when Sister Judy Stephens tracked them down, to see how she could help. By Friday — a week after the fire — Sister Judy, a member of the Sisters of St. Joseph of Concordia, and Kim Krull of Cloud County Community College, had put together a plan to organize donations and plastered the town with fliers asking people to help. The Blade-Empire published a front-page report on the effort. Verleta Moon volunteered the Catholic Thrift Shop to be the “drop off point” for donations, and the Concordia Homestore gave the shop free use of a storage unit so gifts to the Ramirez family could be kept separate from other donations. They’ve also received gift cards from a wide range of local merchants, including one purchased by a teacher at Concordia High School who remembered Katrina (Class of 2004). That was for the Majestic Theatre. Whether they can relax is an open question, but they definitely are not focusing on their loss. That includes their jobs at Shady Cottage, for developmentally disabled adults in Belleville, and looking for a new place to buy once their homeowner’s insurance claim is settled. The fire was officially ruled to be “accidental of undetermined cause,” and Emanuel and Katrina expect a settlement within a few weeks. While they wait, “going on with their life” also means recognizing in an entirely new way the kindness of strangers. “It’s really amazing,” Katrina said again. “This is such a small town and people are so close-knit. What a wonderful response to the needs of the dear neighbor! This really shows the generosity of the people of Concordia. What a great article! Thanks, Sarah!